Give and you shall receive... free bonus gifts. We believe that good customers deserve rewards. So, as our way of saying thanks for your business, we're happy to offer you a choice of the bonus gifts below. Remember, the more you order, the more choices become available to you. Be sure to check this page frequently as we're always adding new gifts for you. 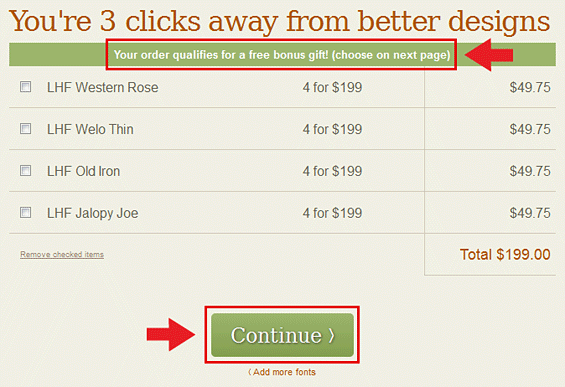 When your order qualifies for a bonus gift, your shopping cart will display a green bar at the top. Clicking the next button will display your available bonus gifts for you to choose. Bonus gift downloads are stored in your Account Manager along with your purchased fonts so that you may download them again in the future. Download this fully vectorized .EPS Alphonse Mucha panel free with any purchase. Expertly drawn by Patrick Kalange. Includes both outline and colored versions. Select Mucha Panel 1 at checkout. Download this useful vintage vector .EPS panel free with any purchase. Expertly drawn by Patrick Kalange. Select Vintage French Panel at checkout. Download this useful vintage vector .EPS panel free with any purchase. Expertly drawn by Patrick Kalange. 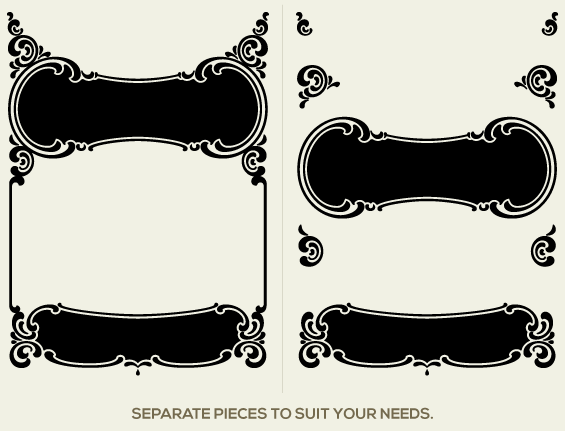 Pieces can be separated as shown to suit your needs. Select Vintage Crayola Panel at checkout. 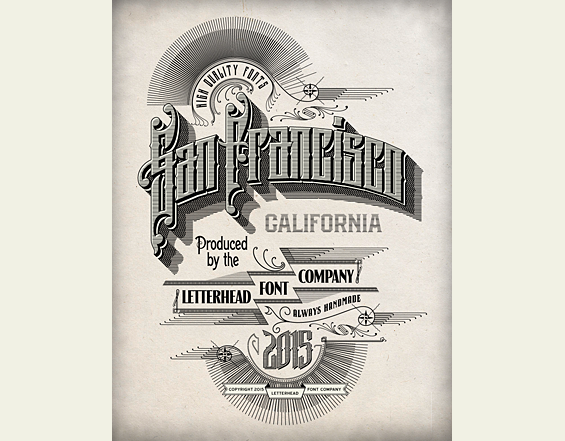 Download this useful vintage vector .EPS panel free with any order of $99 or more. Expertly drawn by Patrick Kalange. Pieces can be separated as shown to suit your needs. Select J B Vaughn Panel at checkout. Download these ready to use vector dimensional letters. Great for dragging and dropping into your designs. Contains CS and Legacy versions with full alphabet, numbers and punctuation. Select Convecta Gold at checkout. Download this vector Sanborn Map Co. panel free with any purchase. Expertly drawn by Patrick Kalange. Goes well with our Sanborn Map Co. fonts. Select Sanborn Panel 2 at checkout. 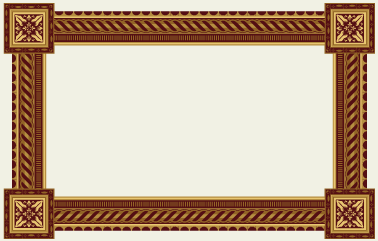 Download this expertly drawn vector cigar panel free with any purchase. Select EV Cigar Panel at checkout. 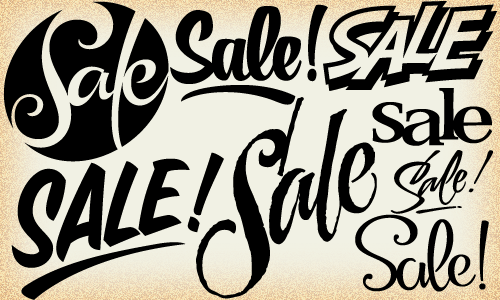 The Davis brothers bring you this set of 36 (plus 3 bonus) different versions of the word "sale" packed into one font. Perfect for creating quick signs and designs. Select LHF 36 Sales at checkout. This font is also available for purchase. Download this free vector scroll panel with any purchase. Expertly drawn by Jennifer Didonna. Select Imelli Panel 1 at checkout. Download this free vector scroll panel with any purchase. Expertly drawn by Patrick Kalange. Goes well with our LHF Bank Note font. Select 950 Vintage Panel at checkout. Download this free vector scroll panel with any purchase. Expertly drawn by Patrick Kalange. Goes well with our Monogram Circle font. Select Bashford Panel at checkout. 4 vector samples of our LHF 62 Ands font. Expertly hand-drawn and ready to use in your designs. Select 4 Vector "Ands" at checkout. 4 vector samples of our LHF 62 Thes font. Expertly hand-drawn and ready to use in your designs. Select 4 Vector "Thes" at checkout. From John Davis' LHF Bergling Panels font, this sample panel is free with any purchase. Select Bergling Sample Panel at checkout. Perfect for highlighting initials or small images. Select Monogram Vector Panel at checkout. Create chic designs with this simple art nouveau panel. Download this fully vectorized .EPS design free with any purchase. Select Simple Art Nouveau Panel at checkout. 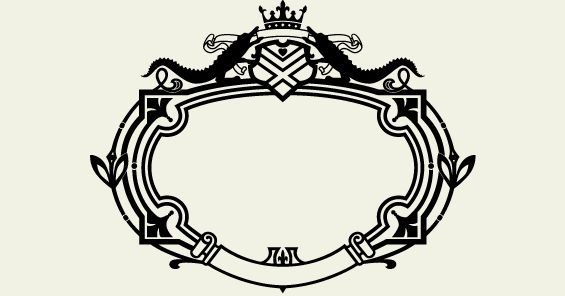 Just add text to this panel to create elegant designs. Select Modjeska Panel 1 at checkout. 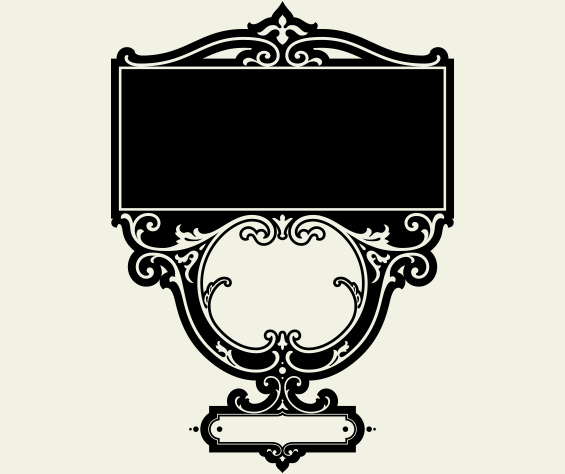 Add a classic frame around your designs. 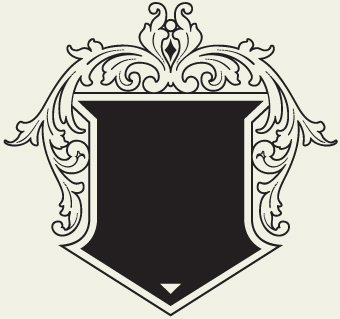 Borders separate easily to make sizing a breeze. Select Vector Frame at checkout. Download this vectorized .EPS file free with any purchase of $60 or more. Works great with Monogram Circle. Select Circular Panel at checkout. Download this fully vectorized .EPS design free with any purchase of $99 or more. Add your own text for a complete design, great for creating certificates and awards. Goes perfectly with LHF Diploma. Select Scalloped Panel at checkout. Your design is sure to be an instant classic with our scroll panel. Download this fully vectorized .EPS design free with any purchase of $99 or more. Select Scroll Panel at checkout. Hours of careful work went into recreating this well-known cigar label. Download this fully vectorized .EPS design free with any purchase of $99 or more. Goes perfectly with LHF Monogram Circle. Select Paid in Full Cigar Label at checkout. After several painstaking hours, this beautiful hand-drawn Stock Certificate Seal is ready for your text. Download this fully vectorized .EPS design free with any purchase of $70 or more. 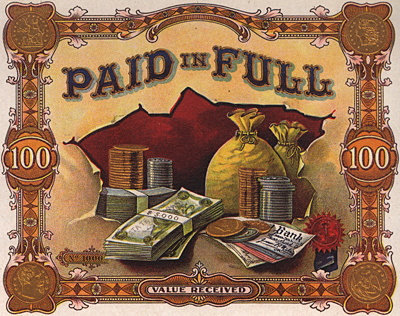 Goes well with our stock certificate fonts like Old Stock & Dickinson. Select Stock Certificate Seal at checkout. Add your own custom text to this panel for an instant design. Download the fully vectorized .EPS panel free with any purchase of $70 or more. Select Leaf Panel at checkout. Download this useful .EPS panel with any purchase of $70 or more. 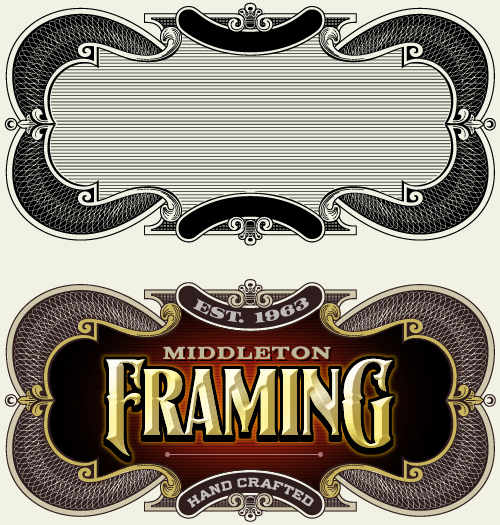 Inspired by an early 1900's cigar label. Add your own text for a complete design. Select Vector Cigar Panel at checkout. Get 2 free vector panels by John Davis. Simply insert your own text for an instant design. Select Vector Sign Blanks at checkout. Just add text to this banner for an instant design. Goes well with LHF Grant's Antique & LHF Chapman. Select Vector Ribbon at checkout. 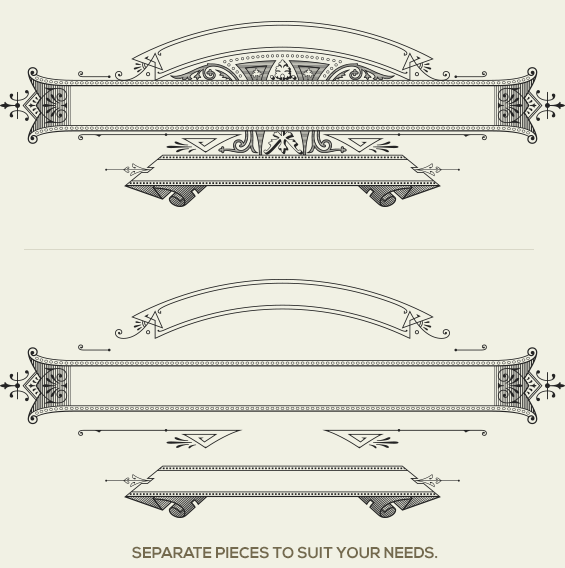 This vector panel is perfect for Art Nouveau style designs. Goes well with LHF Ross Antique Roman & LHF English Rose. 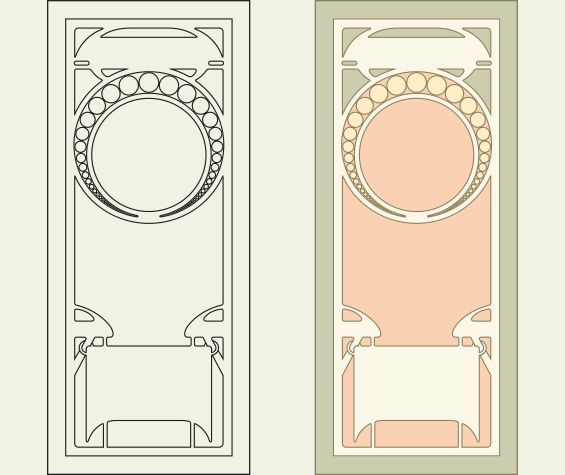 Select Art Nouveau Panel at checkout. Goes well with LHF Saddleback. Select Classic Vector Panel at checkout. Type your text on the ribbon and pair with LHF Monogram Circle for a classic and personalized design. Select Vector Ribbon 2 at checkout. This classic ribbon will make your design stand out. Add an image to the oval to make it pop. Select Vector Ribbon 3 at checkout.